Stochastic variational inequalities (SVI) provide a unified framework for the study of a general class of nonlinear optimization and Nash-type equilibrium problems with uncertain model data. Often the true solution to an SVI cannot be found directly and must be approximated. 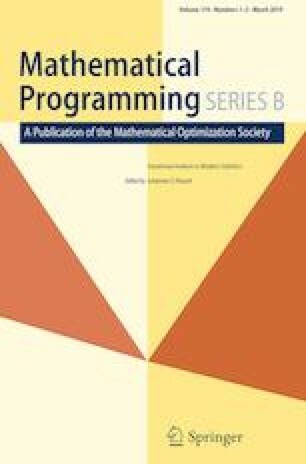 This paper considers the use of a sample average approximation (SAA), and proposes a new method to compute confidence intervals for individual components of the true SVI solution based on the asymptotic distribution of SAA solutions. We estimate the asymptotic distribution based on one SAA solution instead of generating multiple SAA solutions, and can handle inequality constraints without requiring the strict complementarity condition in the standard nonlinear programming setting. The method in this paper uses the confidence regions to guide the selection of a single piece of a piecewise linear function that governs the asymptotic distribution of SAA solutions, and does not rely on convergence rates of the SAA solutions in probability. It also provides options to control the computation procedure and investigate effects of certain key estimates on the intervals. Research of Michael Lamm and Shu Lu is supported by National Science Foundation under the Grants DMS-1109099 and DMS-1407241. Research of Michael Lamm took place during his graduate study in the Department of Statistics and Operations at the University of North Carolina at Chapel Hill. We thank the three anonymous referees for comments and suggestions that have helped to improve the presentation of this paper.